Canada’s off-grid remote communities, the majority of which are Indigenous, are reliant on expensive and dirty diesel-fueled electricity generation. BC is home to a disproportionately large number of these communities. For them, marine energy—wind, wave and tidal—is the predominant local renewable energy option. What’s holding back many of these communities from investing in marine renewable technologies is the lack of available data to assess the raw resource, how they can harness the resource, and how they can synchronize a marine energy supply with local demand. 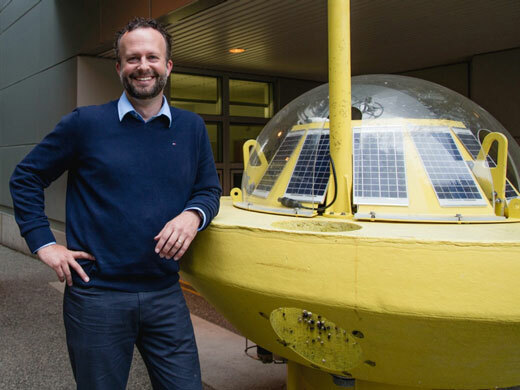 The Pacific Regional Institute for Marine Energy Discovery (PRIMED) is a project led by UVic mechanical engineer Brad Buckham to eliminate the uncertainty and risk that are killing “first-of-a-kind” community based marine energy projects. The project was created with a $1.49M investment by Western Economic Diversification Canada. PRIMED will make use of extensive wind, wave and tide data which Buckham and the multi-partner West Coast Wave Initiative (WCWI) gathered at UVic over the past eight years, and consolidate it with new data gathered by sensors on the new Canadian Pacific Robotic Ocean Observing Facility (C-PROOF)—another UVic project led by oceanographer Jody Klymak which recently received $3.8 million from the Canada Foundation for Innovation. Using simulations, PRIMED will provide detailed predictions of energy supply prior to the deployment of devices. PRIMED is critical to building the trust between communities and technology developers, needed to initiate first-of-a-kind energy projects and anticipates becoming the model that other jurisdictions around the world follow.